Another week, another February 28. This time the year is 1960, the day of the week is Sunday, and the place is the Dallas-Fort Worth area. I'm frequently drawn to these weekend listings; perhaps, especially when I'm working with several issues from the same or similar years, it's because there's not enough variety in the daily programming. At any rate, there's plenty to look at here, along with a few of my patented oddball observations. As I mentioned on Saturday, this weekend sees the close of the Winter Olympics. Sunday's coverage includes the finals of the 80-meter ski jump, and the awarding of many of the metals won during the ten days of the games, which suggests that they weren't always given out the same day as the event. I guess that's one way to keep the athletes from leaving before the Games have ended. Washington senator Henry "Scoop" Jackson, guest on Meet the Press, would probably be considered an extinct species today: a conservative Democrat. He was one of the few hawkish Democrats during the '60s and '70s, and ran for the Democratic presidential nomination a couple of times, back when nominating a conservative was even possible. I wonder if he'd be a Republican today? I'm not sure whether or not there was a sponsor for the "Archibald MacLeish Drama" that NBC ran at 7pm. That's just how it's listed in TV Guide (actually, it's listed as MacLeish Drama, meaning that we were supposed to be able to figure it out for ourselves). I wonder how they actually introduced it on air? Looking at the morning programming, we're struck at the ambivalence in the titles. I mean, since This is America is followed immediately by This is the Answer, apparently "America" wasn't the answer in the first place. And where does that leave This is the Life? Is that the answer? I've mentioned before that I generally take these shows exactly as they're listed in TV Guide, unless I know better. So explain this to me: why does G-E College Bowl have a hyphen in it, when G.E. Theater doesn't? It seems kind of strange, but I believe I've seen promos for College Bowl in which G and E are separated by a hyphen, so I guess that's really the way it was. Hmm. The star of "The Silver Bullet," part of the 7:30am double feature, is Johnny Mack Brown, who was a college football star for Alabama in the '20s. He was the MVP of the 1926 Rose Bowl, capping off Alabama's first national championship team, and had the Heisman Trophy existed back then, he might well have won it. With his good looks and athletic build, Hollywood was a natural next step for Brown (it didn't hurt that pro football wasn't anything close to how we know it today), and he went on to a long, if not spectacular, career. - I don't recall that CBS had a network newscast late Sunday night; if they had it certainly would have been carried by ch2 here in Chicago. Further, Douglas Edwards was CBS's principal anchorman in 1960; Walter Cronkite didn't get the primetime post for another two years. A "conservative Democrat" hardly means the same thing in 1960 as it would today. Especially in the Pacific Northwest: Washington's other Senator was Wayne Morse, who started out as a "liberal Republican"; he switched to the Democrats sometime in the late '50s (approx.). Jackson, like many Democrats of his generation, was a New Dealer. His "conservatism" was almost entirely concentrated on the Vietnam War, which in '60 was still a half-decade in the future. In today's political world, Scoop Jackson might have been a "blue-dog Democrat" at most. Today's Republicans, especially those on the farRight, would want nothing to do with a potential "RINO". A few weeks earlier, TV GUIDE did a feature story about this show. If there was a sponsor, it went unmentioned in the story. TVG had a short-lived policy of omitting sponsor's names from show titles (as in the Chevy Show when Dinah Shore wasn't there), and I thought that might be the reason; can't find anything one way or the other. As to how it would be announced on the air, my best guess would be simply the play's title, The Secret Of Freedom; that's likely how it would be listed these days. - Was Channel 6 in Temple a shared affiliation with NBC and ABC? Alcoa Presents/One Step Beyond was still in its first run on the ABC network at this time (check ch8 on Tuesday at 9 pm). While you're at it, check ch6's pre- and post-primetime for other stray ABC shows. - ABC was showing 21 Beacon Street, in which Dennis Morgan led a small group of agents against nefarious folk, using "sting" operations to bring them down. The principal writer here was named Leonard Heideman. About a year or so after 21 Beacon Street went out of production, Heideman underwent a psychotic break and killed his wife. He was found not guilty by reason of insanity, and was institutionalized for about five years. After his release, some of Heideman;s friends in the business got him writing assignments, for which he changed his name to Laurence Heath. As Heath, he soon became the principal writer - and ultimately one of the producers - of Mission: Impossible (this is the "familiar" I was referring to). You can find the whole story in the archives of Stephen Bowie's Classic TV History Blog (if you haven't already). Let's see - yes, it did list Cronkite as hosting the Sunday late news. According to the always-reliable Wikipedia, he did from 1951 to 1962, when he took over the weekday evening news. The thing about Jackson was that as I recall, he was one of the few "hawkish" Dems left by 1972, the last time I can remember him campaigning for the Democratic presidential nomination. Now, you can ponder what he would be today - there's a lot of discussion over what JFK would be, for that matter - I think Joe Manchin might be the closest parallel in the sense of someone who might change parties at least. 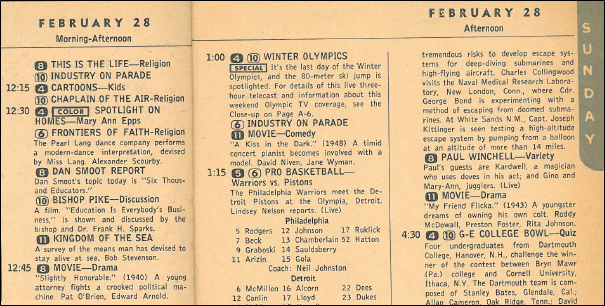 Although Channel 6 was not formally a split affiliation in the sense that it wasn't listed that way, it was a de facto dual affiliate, as it had a lot of ABC programming. Ah, Lawrence Heath - the minute I read his name in your comment, even before you got to Stephen Bowie, I knew what you meant. Yes, I read his remarkable bit about him. Fascinating, wasn't it? Jackson also ran in 1976, even winning a couple of primaries. It's always perilous to try and translate politics of an earlier era with those of the present. Rush Limbaugh began to lose me in the '90s when he tried to claim JFK as a nascent "dittohead" (I don't recall what exactly he was referring to at this point, and it's long since ceased to matter); he tried the same thing not long afterward with Hubert Humphrey, and that was the end. In order to understand this - or try to - you really have to read up on history, and most people nowadays are simply too lazy to do that ... and none more so than the commentariat (Left and Right). On Monday night, ABC had a Bing Crosby special preempting Bourbon Street Beat. Channel 13 in Rockford picked up the Crosby show, preempting Danny Thomas and Ann Sothern; they normally carried Bourbon Street at 10:30 the same night. In its place, ch13 had a syndicated special, a dramatization of "The Fifth Column" by Ernest Hemingway, with Richard Burton, Maximilian Schell, and Sally Ann Howes. And how does TV GUIDE list this program? Mike, I think you're right that it's always difficult to project yesterday's figures onto today's stage. It reminds me of a saying someone had, which I think sums up this blog in a nutshell, but is particularly applicable to what you're saying: "Text without context is a pretext." To assume that anyone from a previous era would have been this-or-that today presupposes that everything else remains constant, which as we know is impossible. Especially in politics, there are always pressures that change things. I don't know if it was you or someone else who commented that Ted Kennedy was pro-life once upon a time. I'm not trying to turn this into politics here, just pointing out that EMK responded, rightly or wrongly, to certain pressures and realities in the political arena, and evolved in a particular way. Who can say what would have happened had something else not happened? Ken - you're right. I'd absolutely forgotten about that. Thanks! Was a Dennis O'Keefe rerun on KWTX-TV in the same timeslot as Dennis the Menace, or was DtM on both KWTX-TV & KRLD-TV? I know Dennis O'Keefe had a show around the same time as DtM, and maybe KWTX-TV was carrying it from ABC. I know that KWTX-TV carried Leave It to Beaver Saturday nights (on a week delay) at 6 PM. Wayne Morse represented Oregon, not Washington, in the U.S. Senate. He switched parties in the early 50s, an Independent between his R to D transition. He eventually was defeated for reelection in 1968 by Bob Packwood, who was also a moderate-to-liberal Republican who resigned his seat under pressure in 1995.